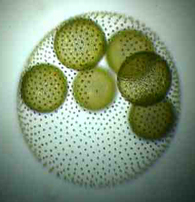 Volvox aureus is a single-celled algae that forms spherical colonies. Volvox reproduce by forming daughter colonies within each spherical colony. They may even form grand-daughter colonies, making three layers of spheres. When the daughter colonies mature, the parent colony disintegrates, releasing the daughters. The name Volvox comes from volvere (to roll). Aureus is the name of an ancient Roman gold coin (aurum is Latin for gold). So Volvox aureus are golden rollers. Linnaeus named Volvox in 1758, and I can’t imagine a better name for these beautiful, delicate spheres. The nested spheres of Volvox appeal to me scientifically and artistically. The first time I saw one under the microscope, the form resonated with me. Now, a decade later, I’ve chosen to borrow their name for my pottery. Leewenhoek discovered Volvox in 1700 but called them animalcules. Stein differentiated V. aureus as a unique species in 1878. For more pictures of Volvox, check out this site from UBC.